Ever have an after-dinner sour limoncello at a fancy Italian restaurant and wonder what it really is and how to recreate the delicious drink at home? Well it’s easy as 1, 2, 3 (plus some waiting time) to make this digestif (after-dinner beverage thought to aid digestion)! This limoncello recipe is from the delightful Karla Vasquez at PK Custom Designs. Karla and I met through The Rising Tide Society – a worldwide network of creatives and small business owners that was established by my amazing wedding photographers Natalie Franke and Krista Jones in order to foster community and support. It’s been so fun to connect and meet new friends through this group! So when Karla said that she makes homemade limoncello (lemon-infused vodka essentially), I knew I wanted to try out her recipe. On top of that, she creates custom labels – for her limoncello, for wine bottles, beer bottles, candles, etc. – that are perfect for unique wedding favors or for those that create a product in need of a label! Check out all that she does here. 1. Peel the lemons with a vegetable peeler, trying not to scrape the pith (the white fleshy part underneath the peel). 2. Place the peels in a 1 quart jar and fill the jar with vodka. Screw the lid on tight. 3. Store the jar in a cool, dry place for a minimum of 4 days and as long as a month. The longer stored, the more lemon-flavor will be infused. 4. After the vodka has had time to infuse, line a strainer with a large coffee filter and set it over a 4 cup measuring cup. Strain the vodka through the filter. 6. Stir the syrup into the vodka and taste. Add more sugar if desired. 7. Fill bottles using a funnel and add a pretty custom label. 8. Store the bottles in a cool, dry place and chill in the freezer or refrigerator for at least 4 hours before drinking. I hope you had a delicious holiday weekend! No matter what holiday(s) you may or may not celebrate, it was a good three day weekend to get together with friends and family. My mom and I baked German spice cookies on Saturday, but that recipe will have to wait another week, because this week I’m sharing this yummy and festive candy cane sugar cookie recipe that I made last week. This is perfect for: a. people who don’t like chocolate (aka crazies but they exist), b. doing something with left-over candy canes. 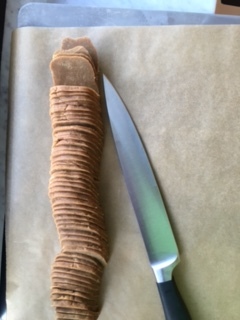 I adapted this recipe from allrecipes.com for chewy sugar cookies, but with some added twists. In my version, I cut their recipe in half, producing 15 large-ish cookies. 3. Smash up your candy canes in a Ziploc bag using the back of a frying pan or meat hammer or whatever other heavy object you have lying around. Definitely don’t grind it into a powder – think little chunks, like marbles or slightly smaller (and for those of you who are too young to know what marbles are, think of small pebbles). Keeping the candy cane chunky will add a good sticky crunch to your cookies. NOW!! HERE’S WHERE YOU CHOOSE YOUR OWN ADVENTURE!! You can EITHER stir your smashed candy canes into the batter so that the pieces are spread throughout the cookie OR you can save them for last and place them on top of the cookies before they’re baked (see pic below for second version). Personally, I think the cookies taste the same either way but they look prettier with candy cane on top, so that’s how I’m going to continue this recipe, but if you’ve already stirred your candy canes in at this point, then you should’ve kept reading until the end of this paragraph to realize that’s not where I was going. 😉 Just kidding – they will still be delicious. 11. Use your tablespoon to scoop out balls of dough and roll them into balls using your fingers. 12. Roll them in the sugar. 16. Bake one sheet at a time. Start checking the cookies at about 10 minutes. Mine ended up going for 13 and were super chewy in the center and nice and crispy around the edges with sticky candy cane bits! One of my all-time favorite holiday treats is peppermint bark. I’m particularly taken with the Ghirardelli version which uses dark or milk chocolate layered with white chocolate, and what appear to be crushed up bits of candy cane. But I sometimes feel like store-bought chocolates can be a bit waxy and I strongly prefer dark chocolate to other kinds. (85% cacao is an excellent mid-afternoon snack to wake up and because it’s so strong, no fear of eating the whole bar!) It seems like most of the peppermint bark in stores has at least some element of white chocolate in it, which I could do without. So I decided to make my own wintery peppermint bark with deep dark chocolate, crushed up candy canes, and a bit of peppermint extract for an extra minty kick. Note that you can use other kinds of chocolate to suit your preference! It’s such a simple recipe, but you’ll need wax paper or even better, shallow silicone ice trays which will make perfect little rectangles! Or you could find some fun holiday shapes like pine trees! Or make your own Hanukkah gelt if you find a tray with circlular molds. Melt your chocolate. I chose a mix of 70% and 86% cacao which is bitter but still palatable as a dessert. (Pick your mix of favorite chocolates!) Use a glass bowl set over a pot of boiling water (not touching the water) and continually stir the chocolate until it’s a smooth glossy liquid. Start with either a bag of chocolate chips or 5 standard size bars. This will make enough treats to eat yourself and share with a few friends. Depending on how much chocolate you use, you will want a candy cane ratio such that each bite gets some chunks. For 5 chocolate bars, I used a total of 8 regular candy canes (they taste so much better than those round red and white dinner mints). First I finely crushed up 3 candy canes in a Ziploc bag using a meat hammer (you could also use the back of a frying pan). Once the chocolate was melted and smooth, I turned off the stove heat and mixed in my 3 crushed candy canes and ½ tsp of peppermint extract to really amplify the mint flavor which can get lost in the overpowering dark chocolate (guess that’s why it’s standard to use white chocolate). Line a pan with a lip (I used a pretty small one since I only used 5 chocolate bars) with the wax paper so that the paper hangs over all the edges. Pour the chocolate mix onto the wax paper and use a spatula to spread it evenly (or evenly pour the mixture into your silicone ice trays). Then, in the Ziploc bag, I crushed up the remaining 5 candy canes into a mix of small and medium chunks. Don’t crush them into too fine a powder or else you won’t get that satisfying candy cane crunch in your bark. Sprinkle these crushed candy canes over the chocolate along with a smattering of sea salt (a trick I learned from Carla Hall on The Chew). Refrigerate until hard. Either pop the chocolates out of the silicone mold or break up the large chocolate sheet into bite sized chunks with a knife. Wrap them up in cellophane or craft paper and make cute tags for friends and family! Yum! I love baking seasonally-inspired cookies around the winter holidays. Recently, I’ve made gingerbread men and speculoos cookies (a Belgian and Dutch ginger-graham cookie, like the kind they serve on Delta). The warm flavors of cinnamon, ginger and nutmeg play well together and the quantities can be tweaked to really make one pop. One of my favorite cookies to buy and eat (all year round) are crunchy ginger snaps. More crispy and gingery than gingerbread, ginger snaps are a relatively low cal cookie (relatively, they’re still cookies). And my mom says that if you are craving chocolate, eating ginger can satiate the craving instead! Also, I am obsessed with molasses. I think it is delicious, so I added a bit more than the original recipe called for. I know they say baking is a science and each ingredient must be properly measured. And that’s probably true for the main ingredients that make the base of the cookie – flour, egg, butter and sugar. But I like to play around with the measurements of the other ingredients, like ginger, salt and molasses, to see what textures and flavors different quantities will bring out. I’m really not precious in measuring the spices uber precisely. It doesn’t always make for the prettiest, most perfect cookies, but 9 times out of 10 they are still extremely yummy! I found a base recipe on finecooking.com. Below find my adjusted recipe based on the ingredients I had on hand and my experience in recreating a seasonally-appropriate ginger snap. Cozy up with some tea and start dunking! Mix this for about 3 minutes until the batter is smooth and light-colored. Then add: 1 egg yolk (also at room temperature) and 3+ tablespoons of molasses. Mix for one minute more. With the mixer going at medium-slow, add the dry ingredients in 3-4 pours. Mix until rough pebbles form. 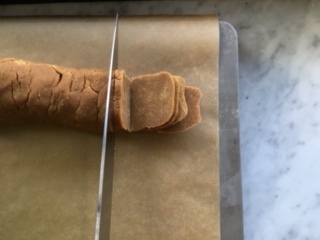 Knead and shape (the dough isn’t moist enough to really roll so just form it with your hands, gently pressing it together) into two 7-8 inch long logs about 1.5-2 inches in wide. They may turn about a bit square from sitting on a flat surface as you work the dough into the sticks. Then wrap them in plastic or plastic baggies. Refrigerate for 3 hours. When you’re ready to make the cookies, preheat oven to 350 degrees. Line 2 large cookie trays with parchment paper. Place the rounds on the sheets. They don’t spread much and if you’ve cut them thinly, they won’t rise much either. At this point, I would sprinkle some sugar on the tops of the cookies and gently press it into the dough. I didn’t do that this time around, but that would be a lovely addition. As you can see, this recipe can make about 100 silver dollar-sized cookies. 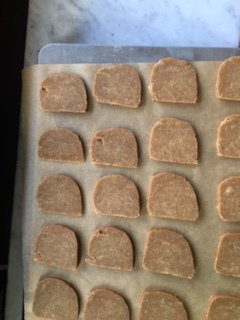 Bake one sheet at a time for 10 minutes until edges are slightly darker brown than the middles. I would start with 9 minutes and give them a check depending on how thinly you’ve sliced them and how large they are. Add additional minutes for crisper cookies, but be sure not to burn them! Let the cookies cool about 15 minutes on the sheets to set up and then gently twist and pull each one by hand to remove them from the pan. Allow them to fully cool on a wire rack (or let’s, be honest, on a plate if you don’t have a rack). Normally, I would scarf down some piping hot cookies, however these are actually one cookie that is better fully cooled to get the true ginger flavor and a bit more crunch. Pour that Earl Grey or coffee with cinnamon and enjoy!